This Zephyr Weathervane is one of our personal favorites. While it looks very ornate and decorative, if you look closely, you will actually see Zephyr’s face with cheeks puffed out, blowing the wind. Hint: turn your head ninety degrees to the left and look again! Zephyr blowing the wind is a most appropriate subject for a weather vane because Zephyrus is the Greek God of the west and gentlest of the winds. The Zephyr Banner Weather Vane featured here was originally commissioned to be mounted on a cupola in a small shopping center. It is cut from heavy gauge brass sheet supported on copper tubing. Because we make these weathervanes to order, our customers select the metal combination that appeals to them. They can also choose to accent using optional gold or palladium leaf. By adding gold or palladium gilding your weathervane will retain a brightness and contrast as it darkens and weathers, even in evening light and against a busy background. An interesting fact about our Zephyr weathervane is its association with the Tower of Winds in Athens Greece. The tower was built in either the 50th century BCE or the second century BCE before even the Roman Forum. It is the source of the earliest known reference to copper weathervanes. 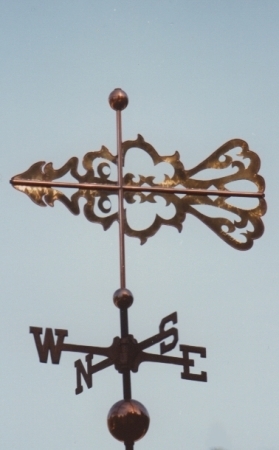 The Tower of Winds is described as having a hand hammered copper weathervane-like Triton that indicated the wind direction. That weathervane would have been made much the same way we make our weathervanes today; entirely by hand. The Tower of Winds is a 12-metre-tall structure that has a diameter of about 8 meters and was topped in antiquity by a weathervane that indicated the wind direction. Below the frieze depicting the eight wind deities (Boreas (N), Kaikias (NE), Eurus (E), Apeliotes (SE), Notus (S), Livas (SW), Zephyrus (W), and Skiron (NW) there are eight sundials. Our Zephyr Weathervane has roots that date back in millennia to the Hellenistic Greek Age. A west wind (Zephyrus) is a wind that blows from the west in an eastward direction. In Greek mythology, Zephyrus was the personification of the west wind and the bringer of a light spring and early summer breezes; his Roman equivalent was Favonius. In the myth of Cupid and Psyche, Zephyrus was the attendant of Cupid, who brought Psyche to his master’s palace.